Toby Blackwell has moved to secure the future of the Blackwell bookshop chain as a private business by setting up an "impervious" 80-year trust that will take ownership of the voting shares after he dies. In an interview in The Bookseller this week, Blackwell said that he wanted to prevent his family from any "interference" in Blackwell's following his death, and has earmarked £1m in case any "defensive action" is required. He stressed that he wanted the firm to remain private. In the past the family has been beset by infighting over the ownership and direction of its retail wing, as well as its publishing business, which was finally sold in 2006. Blackwell, who is also known as Julian, said he was "as loyal . . . as a man can possibly be" to the firm, which was founded by his grandfather, Benjamin Harris Blackwell, in 1879. One-third of the shares are already in the Primary Julian Blackwell Voting Trust, which was set up in 2006. The remaining two-thirds, which Blackwell holds, will be transferred to the trust upon his death. Blackwell's board is understood to be aware of the situation. 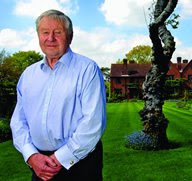 The trustees comprise Blackwell's "most trusted and loyal friends"—Steven Jeffcott, who has been his commercial and tax adviser for 20 years, and Greg Stonefield, his corporate lawyer. A statement about the trust read: "This trust has been most thoroughly drawn up so that it will be impervious to any attempted interference by my family." Blackwell added: "The company will continue—people say you can't influence it after your death, but I say if anybody buggers about, I'll come back and haunt them." Blackwell also outlined his wishes that the company remain private, and that it should not depart from its "basically academic nature". He added that it "should never get delusions of grandeur and go off into trying to rule the world". He also alluded to the wish that the company not be sold off, stressing that the library supply and UK retail divisions were "big and specialised enough to survive and be profitable as a standalone company". Blackwell said he would not take any further remuneration or dividends from the company, and that he expected this to apply to his wife and three children "to whom I have given very substantial funds". Likewise, he said he would not invest further in the bookseller.